Sorry I haven’t updated the blog in a few days, work has been hell and I’m not going to use my own free time to write in my blog, free time at home is for playing =). I was able to witness a new boss kill for myself, Void Reaver down. I was one of the tanks upfront and when I had the agro I tanked the boss clean with no screw ups. All in all that’s seriously an easy boss fight for a tank. Especially since I only tanked him about ¼ of the time since he does an agro dump knock back. We had to reset him a few times because people were not dodging the lighting balls and dying to early but other than that It seemed like a clean run. I forgot to take a screen shot of the kill, I think the reason is because I’m just not that excited about raiding like I was on my old server. Niether of the real life friends I transferred over with feel like playing their alliance anymore (wtf did they want me to transfer for, really pisses me off actually) so they weren’t in the raid. After the VR kill the guild headed off to attempt LEO in SSC but I had to log off because my kid and girlfriend are both sick so I had to make some dinner, help around the house, etc. They didn’t kill him but they are getting closer from what I’m told. Hopefully I’ll get in the next SSC raid and get to experience a LEO kill. This week I mostly did pvp on both my warrior and my horde 70 hunter. 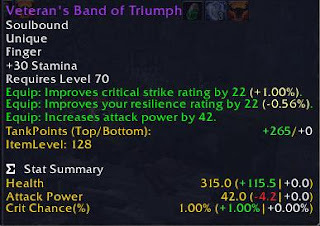 Why my 70 hunter? I don’t know I guess because I’m bored on this new server and playing a hunter is at least something different. My hunter at the moment has around 40 resilience, so he needs a ton of work if I plan to really ever arena with him for real. Several times this weekend I joined up in some premade AV’s. AV’s are not made premade through blizzard but there is a mod out right now that will queue everyone up at the same exact time which means your whole raid pretty much gets put into the same AV. On a normal queue of 40 members at least 30+ would get into the same AV. In general chat some people were saying you could get suspended for using this mod, but I have not seen anything about it on the blizzard forums so until I do I guess ill risk it. A normal AV game would last around 12-15 minutes max and we got at least 400 honor each run. I farmed about 13k honor over the weekend on my hunter and I spent more time on Raydz that I did on Hoss, the AV premade honor was awesome. I’m already looking forward to next weekend because I think it’s actually AV double honor! Hoss also has around 1800 arena points to spend so I’ll be picking up my Season 3 helm next Tuesday which I’m looking forward to. I think I thoroughly enjoy battlegrounds more with my horde than I do alliance for two reasons. 1. As a hunter in a bg I die very rarely when compared to my warrior. Which means im alive and gathering honor from player kills a much longer time. That means besides bonus honor im still raking in points just for staying alive and shooting from afar. As a warrior I have to charge in to the fray and become targeted to kill almost instantly meaning I spend a good deal of my time dead. 2. 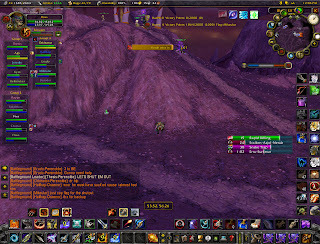 The horde seem to dominate almost every single battle ground we go in. I did several Arathi Basin and I can’t count how many times we 5 capped the alliance. One time in EOTS we didn’t even let them score a point! 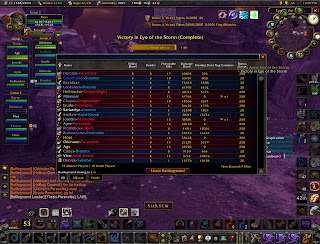 Winning almost all the battle grounds is much more fun than losing them over and over with alliance. I have noticed that one key to hordes success in Arathi Basin and EOTS is that we never stop pushing for new nodes. In almost every AB or EOTS I’m in with my alliance I can’t tell you how many times I have seen someone say “Okay Hold these 3!”. Meaning play defense until horde gang up on us and take away a node. When I’m on Hoss (horde hunter) it’s just a constant group of horde going to alliance nodes pushing to conquer a new one while alliance sits there and tries to play D never pushing back. If alliance would just take 3 nodes and then go for a 4th the horde would be pushed back to D allowing for alliance to take control of the board. I just don’t get it sometimes why alliance pugs play BG’s like they do. 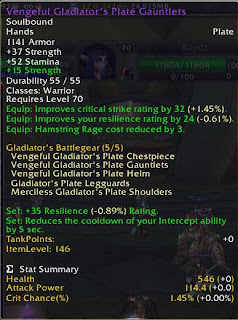 I didn’t get nearly as much honor with Raydz as I did with Hoss since alliance rarely wins ANYTHING but I was able to pick up two new pieces of gear. This puts Raydz up to 280 resil which isn’t awesome or anything but it’s a lot better than most. I also did arena’s with both characters over the weekend but I’ll post about that later. It was nothing exciting really many losses with our horde (that’s to be expected with 40 resil) and some new strats with alliance that may/may not pay off. Tonight the guild has no raids scheduled so I’m probably just going to dive into some more BG’s im not sure with which character yet.